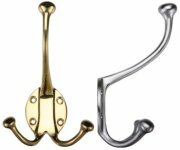 Premium quality solid brass Victorian hat and coat hooks, supplied with fixings. Overall height: 5 ½ inch 143mm. 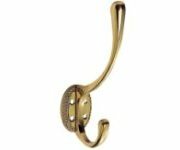 Solid brass Victorian hat and coat hooks, supplied with fixings. Overall height: 5 inch 127mm. 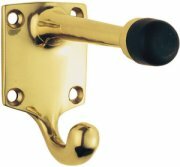 Architectural quality solid brass hat and coat hook with rubber door stop. Size 5 inch (127mm), projection 86mm. 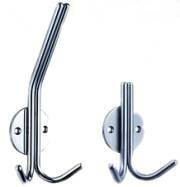 Stainless steel coat hooks. Available in double coat hook size 184mm in length x 38mm projection, and single hook size 100mm in length x 35mm projection on a 47mm diameter rose. Supplied with fixing screws. Stainless steel single robe hook on a 35mm diameter back rose, 42mm projection. Solid brass Old English heavy pattern hat and coat hook. Overall height 6 inch (152mm). 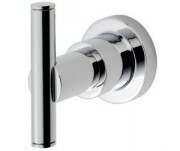 Available in Polished Brass, Polished Chrome, Satin Chrome & Polished Nickel. 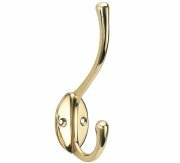 Solid brass heavy pattern double robe hook by Fulton and Bray. 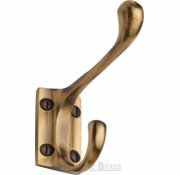 Solid brass coat hook rack with four coat hooks. Width 223mm, projection 64mm. 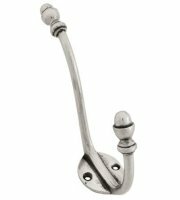 Natural smooth cast iron hat and coat hook with acorn style ends. From The Anvil Beeswax Gothic style hook, hand forged with colours left in the steel from blue to deep red ochre and then coated in beeswax. Seven hand forged and beeswaxed Gothic coat hooks mounted on a solid wooden back board in a choice of two finishes. A natural finish which has been oiled and given a rustic aged effect or a classic countryside style painted in olive green with a distressed effect. 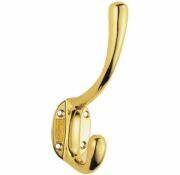 Robe hook in polished chrome. Width 47mm, height 70mm, projection 72mm. Solid brass Georgian hat and coat hook. Size 5 inch (127mm).